First, a real exchange between two strangers on the steps to the upper viewing arena in the Kool Haus Sunday night. Rick Ross fan No. 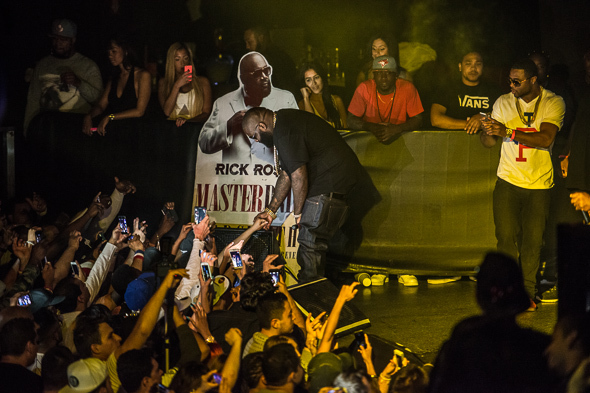 1: "Man, this is one of best hip-hop concerts I've seen in a long time!" Rick Ross fan No. 2: "Uh, it's midnight and no one has been on stage yet." Rick Ross fan No. 1: "That's not the point. It's the vibe. You know what I'm saying, right?" 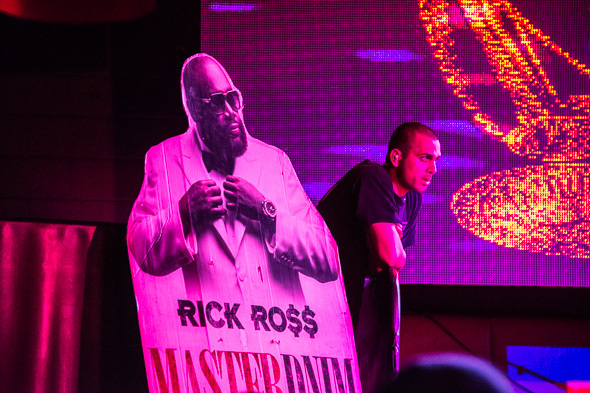 How much a concertgoer enjoyed Rozay's 47-minute set in support of the one-man beard gang's banging new Mastermind LP Sunday night at Kool Haus was very much dependent on expectations. Those who showed up at 9pm looking for flawless breath control, surprise guests, polished video accompaniment, a live band, a deep dive into less-heralded cuts from his six albums, or stage diving left short-changed - perhaps feeling like Dwayne Wade and Chris Bosh weren't the only ones who could've repped a little harder for Miami on this night. A ticket at the door could be had for a cool $80. But those - such as Ross fan No. 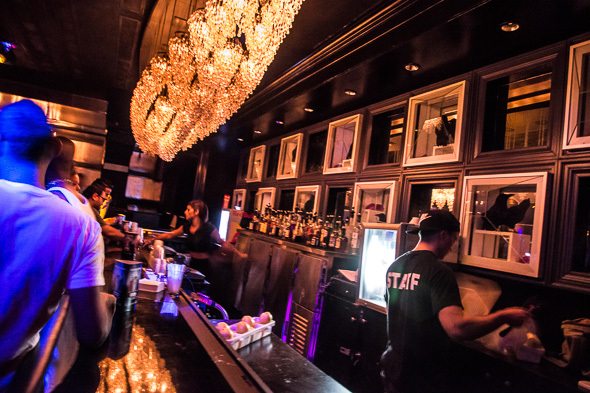 1 - content to listen to club-rattling beats twisted to 11, watch avid clubgoers dance lustily atop gigantic subwoofers on floors slippery with cranberry-vodka - well, they found their happy place. 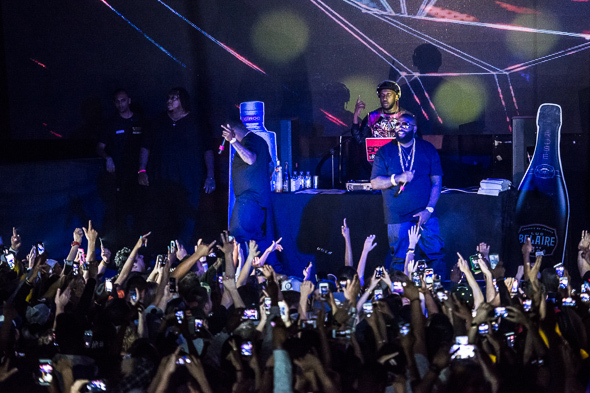 After a prolonged and Drake-heavy warm-up set by DJ John J that stretched past the Heat's failed NBA title defence and into Monday, the Bawse took the stage at 12:20am to the thunder of "B.M.F. 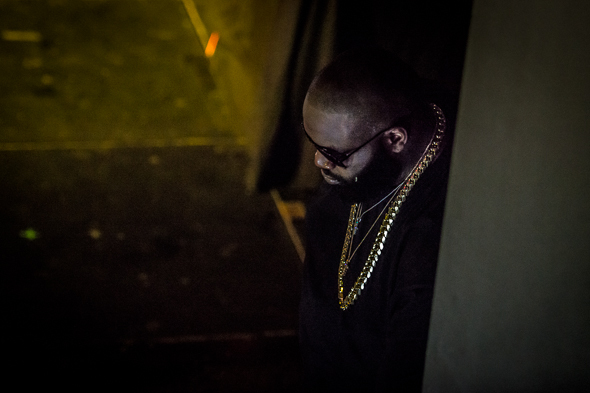 (Blowing Money Fast)," supported by DJ Scream, one hypeman and cardboard advertisements for his liquor and his album. Decked out in a canary-gold watch, matching bracelet and one more chain than 2 Chainz (that's three chains, for those scoring at home), the jewels sparkled in the smartphone glare off Ross's black tee-back jeans-black sunglasses ensemble. For reasons apparent to maybe two people, Ross marched out middleweight Canadian boxer Jean Pascal, who slung a pair of championship belts over the big man's shoulders, increasing the bling factor. Then he left. With little banter or crowd interaction, the former corrections officer ran through a string of his surefire smashes: "John," "I'm a Boss," "New Bugatti," "Hustlin'," "Fuckwitmeyouknowigotit," "Devil Is a Lie," "Pop That," "Diced Pineapples," "I'm on One," "Stay Schemin'," "Aston Martin Music" (slam dunks, all). Halfway through the set, though, you realize just how reliant on stellar guest appearances those singles are, and how a portion of the magic gets stripped away by their performance live in a Ross solo set. You want badly to here "Sanctified," a standout from Mastermind, yet the song goes un-played, but you remember that Kanye West and Big Sean had the best roles in that tune anyway. 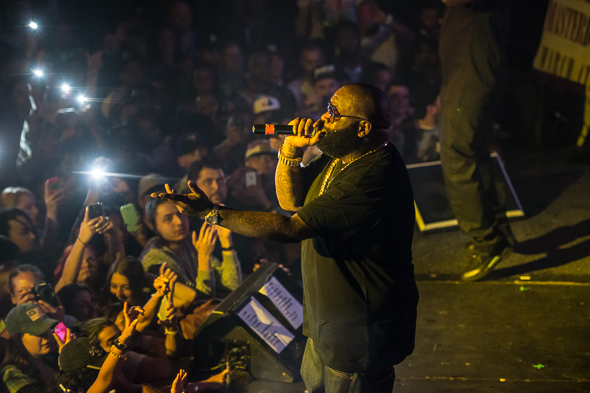 Rozay finishes with his Souls of Mischief-jacking Lil Wayne collab "Thug Cry," then asks his DJ to play labelmate Meek Mill's new single, "I Don't Know," over the speakers. So what if the climax is Ross nodding his head to someone else's song? He's always pushing the brand. 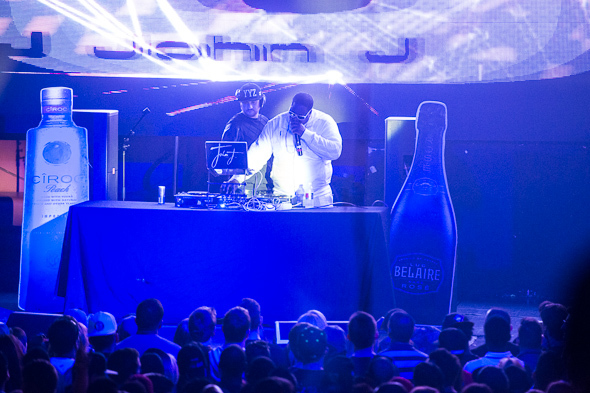 Then the rich man shakes and pops a black bottle of champagne, spraying the crowd before he exits, sans encore. The symbolism splashes well beyond first three rows.